With easy access from the 405 (between 110 and 107), our 12,000 square feet, two-story Specialty Hospital on West 190th Street, Torrance is here for you and your pet. 24×7 emergency services are on stand-by to assist you when your primary veterinarian is unavailable. In addition, services such as Cardiology, Critical Care, Internal Medicine, Neurology, and Surgery are available. 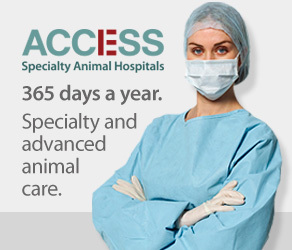 Staffed with highly trained doctors, specialists, and veterinary technicians – all backed by state-of-the-art equipment – our team prides itself for delivering the wonderful compassion and care for which all ACCESS Hospitals are known. Should your require further information, please, don’t hesitate to call us at (310) 320-8300 day or night!